We are proud to announce that TX Text Control 15.0 is going to be released in quarter 2 of next year. This will be a very feature-rich release of TX Text Control .NET for Windows Forms and ActiveX. One of the new features of the components is an extension of the existing Adobe PDF export. In version 15.0, TX Text Control will have the ability to create and save ISO conforming PDF/A documents. In recent years, PDF/A has been gaining popularity in the electronic archiving market. Using TX Text Control 15.0, PDF/A documents can be automatically created or converted from other supported formats. Additionally, we will present a completely new concept of completing forms on the web in a true WYSIWYG manner. Using TX Text Control 15.0, MS Word compatible forms can be displayed and completed in any browser, without the need for any plug-in or download: Just pure HTML. The completed form can be processed server-side, printed or saved as an Adobe PDF document. Our development team also improved the core functionality of TX Text Control. Page columns and structured numbered lists are planned for the next version of the successful word processing component. All documents can be imported and exported to and from Office Open XML (DOCX), MS Word (DOC) and Rich Text Format (RTF). Additionally, a valid XHTML export is going to be supported in version 15. 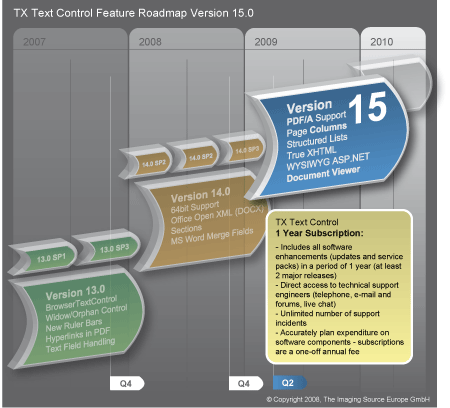 You can start your development with TX Text Control now, as TX Text Control 15.0 will be backwards compatible. You can purchase TX Text Control 14.0 Subscription now to get version 15.0 for free when it is released.